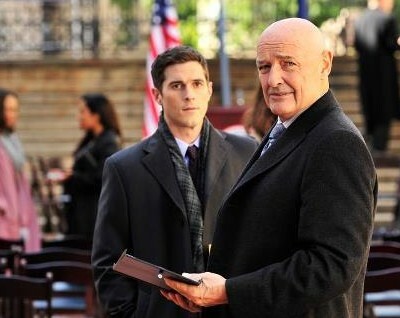 To little surprise, ABC has cancelled 666 Park Avenue, their struggling Sunday night series. While the network will air all 13 episodes, there won’t be any after that. In addition, ABC also cancelled Last Resort today and CBS canned Partners. 666 Park Avenue follows a Midwest couple who’ve moved to New York City. They end up managing The Drake, a prestigious residential hotel that’s not as nice a building as it seems. The TV series features the talents of Terry O’Quinn, Vanessa Williams, Dave Annable, Rachael Taylor, Robert Buckley, Mercedes Masöhn, Helena Mattsson, Samantha Logan, and Erik Palladino. The show debuted on September 30th, in ABC’s troubled Sundays at 10pm timeslot. The premiere’s ratings weren’t very impressive, attracting a mediocre 2.1 rating in the 18-49 demographic with 6.9 million total viewers. That was 30% lower than what Pan Am had registered a year earlier. Park Avenue’s numbers have gotten even worse since the debut. The coveted demographic dropped to a 1.7 rating in week two (down 19%) and a 1.5 rating in week three (down another 12%). The ratings perked up a bit in weeks four (a 1.7 rating) and five (a 1.6 rating) but dropped to a 1.2 rating last Sunday. But, what do you think? Should ABC have cancelled 666 Park Avenue? Will you miss the show? I really liked this show. I enjoyed the twists and turns of the script. I think that they gave up too soon. Remember Twilight zone did not have a great following in the beginning. Neither did many of the “classics”. I am sorry to see it end. I live in South Africa and used to watch the episode on our local network DSTV. I thoroughly enjoyed the show and loved the actors. With so many choices out there it must be difficult to get a devoted audience, but believe me in SA it had a following. I really liked 666park avenue, I was looking forward to watching the next season. I wish they would bring it back. I liked the show I had to watch it online but I watched every episode and eas waiting for it to come back on. very disappointing it won’t be back one of the best they had. I watch it on line early in the morning. How do you know that many others don’t also! I loved the show. It was something I looked forward to watching when it came on during the weekend. I loved the plot and how it left me wondering about so much more. Especially the last episode where the main character found out who her real father was and then apparently prego… Not everyone can be at home at all these times to watch the shows they want. I would like it to come back on. I love the show, I like the Plot. the charters this show had a long career if you would have play it out. and made it stay like it was going Before ya’ll decided to kill off everybody. so much that could have been. put it on when nothing else is on.. if that’s what it take. I LOVE THE SHOW. Loved this show and was extremely disappointed that it has been cancelled once again. Please bring this show back. Actors were great, and it was very different. Bring it back. Stop cancelling all the good shows!!!!! the show was what I waited all week to see and now you have cancelled it. Please, please bring it back!! One of my favorites!! Bring the 666 Park Ave back. Is a good show and deserve a second chance.